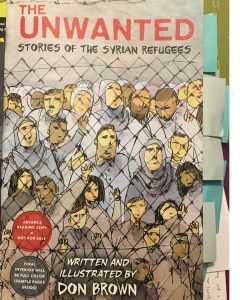 The Unwanted: Stories of The Syrian Refugees by Don Brown. HMHTeen, 2018. 9781328810151. 105pp. Brown’s graphic novel opens with protests in Syria in March 2011, and the violence that followed. As Syrians flee the country and Assad’s soldiers, others join the fight. Hardships plus the possibility of torture and execution force many to make difficult choices for themselves and their families. Overloaded ships overturn at sea. Profiteers are everywhere. It’s not clear who refugees can trust or where they can go, but leaving seems like a better, safer bet than staying. The book doesn’t follow a single refugee on her harrowing journey, but instead summarizes the experiences of many based on diverse sources. Individual faces are often drawn somewhat indistinctly, more so in crowd scenes. Despite the circumstances, there are moments of joy and hope. The book made me realize both the scope and scale of what’s happening, and in giving specific examples (with sources cited) and bringing different people into focus (even for just a page or two), it makes it clear that every person in every crowd is dealing with their own particularly difficult experiences. 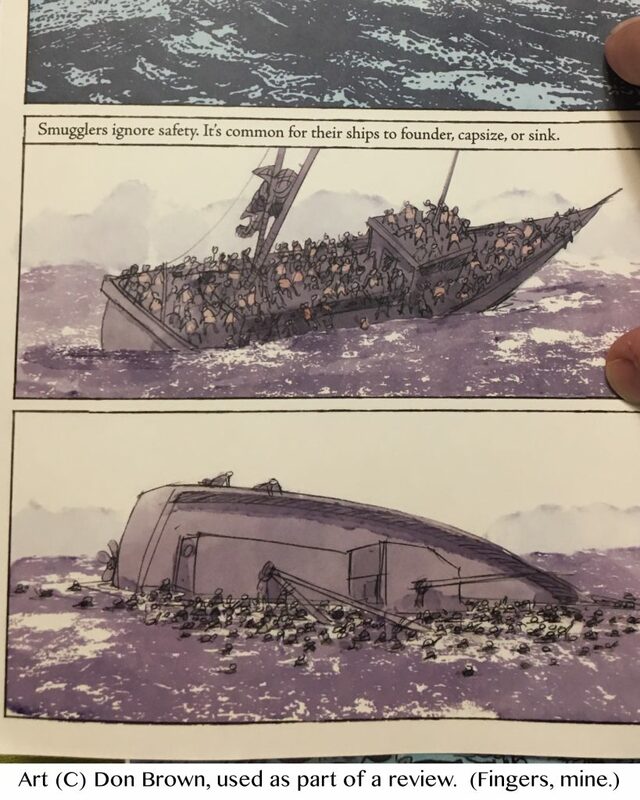 In Brown’s notes, he says he wanted to focus on the refugee experience, and disregarded everything else to avoid creating “an enormous, sprawling book, one that would not be well served by a graphic novel.” Included in the back are journal summaries from his visits to a refugee camp in Greece in 2017 (along with photos), source notes on particular pages that include the sources of dialogue, and an extensive bibliography. Kudos to him for all of this — it’s not the standard in nonfiction graphic novels, but it should be. While this book may not answer every question about Syrian refugees, it is a great graphic novel.